We at Tico Coffee Roasters craft roast sustainable, exclusive and unique Grand Cru coffees in very small batches and import the finest teas guaranteeing product freshness and consistency. Driven by a passion for excellence, we have specialized in bringing only the best coffees and teas directly from the producing countries. And because we are a boutique roaster, we have the liberty to choose from the best Arabica green coffees and the world's finest teas for a truly unique experience. We started Tico Coffee Roasters in 2010 out of the dream to provide a unique coffee and tea experience to the coffee and tea lovers in the Bay Area. We, the two owners of Tico Coffee Roasters, have a very different heritage and skillsets that we bring with us and combined they are the perfect ingredients for a specialty coffee and tea business. 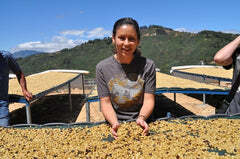 Mariana grew up in the province of Heredia in the heart of the coffee lands in Costa Rica surrounded by coffee plantations and has built her career in Costa Rica as an Agricultural Economist before she moved to the US. Her partner and husband Thomas grew up in Germany and has spent most of his career in engineering, which comes in very handy for the craftsmanship of roasting coffee. Tico Coffee Roasters is named to honor the heritage of Costa Rican coffee growers and to reflect the origins of Mariana and her love for coffee. The word Tico is a colloquial term that is used for a native of Costa Rica. Tico Coffee Roasters coffees and teas are smooth, daring, and unforgettable. Whether your tastes run from the classic to the exotic, we've got the perfect cup for you. All our coffees come from small coffee farms and have to go through extensive quality control. Our direct trade relationship with the farmers ensures the coffee growers get their fair profit and can successfully conduct a sustainable business. We deliver our coffees daily fresh roasted. For our teas we only acquire raw materials of the highest quality and they are refined exclusively in Hamburg, Germany. We sell these boutique coffees and teas through our Tico Coffee Roasters Online Store and select fine retailers. Tico Coffee Roasters is a member of the Campbell Chamber of Commerce, the San Jose Silicon Valley Chamber of Commerce, the Specialty Coffee Association of the Americas, the Good Food Merchants Guild and the Alliance for Coffee Excellence which manages the Cup of Excellence® program. Our mission is to give our customers the ultimate experience by providing them with the finest coffees and teas available in the market. Our vision is to be the partner of choice for coffee and tea lovers when looking for a superior experience. As a responsible corporate citizen, Tico Coffee Roasters aims to link people, nature and technology in a environmentally sustainable way.